Habit: Shrub, tree, spiny. Stem: branched near base [or trunk 1, thick, fleshy]. Leaf: simple, alternate, small, +- fleshy, glabrous, generally produced after rains, of 2 kinds: 1° on long-shoots, subtended by decurrent ridge on stem, blade generally early-deciduous, petiole persisting as spine; 2° clustered on short-shoot in axils of 1°, +- persistent, not spine-forming. Inflorescence: spike, raceme, or panicle, axillary or terminal; flowers many. Flower: sepals 5, unequal, overlapping, +- scarious, persistent; corolla bright red [yellow], tube cylindric, lobes 5, overlapping, spreading; stamens 10--20+, in 1 or +- 2 whorls, filaments free; pistil 1, ovary superior, 3(4)-chambered at base, placenta axile at base, parietal above, ovules +- 3--6 per chamber, style 3(4)-lobed. Fruit: capsule, loculicidal. Seed: elliptic, angled or winged. Genera In Family: 1 genus (including Idria), 11 species: southwestern United States, Mexico. Stem: erect to outwardly arching or ascending, 6--100, 2--10 m, generally < 6 cm diam, cane-like, leafless most of year; bark gray with darker furrows; spines 1--4 cm. Leaf: 1° 1--5 cm, petiole 1--2.5 cm; 2° 2--6 per cluster, 1--2 cm, 4--9 mm wide, petiole 2--8 mm, blade spoon-shaped to obovate, tip rounded to notched. 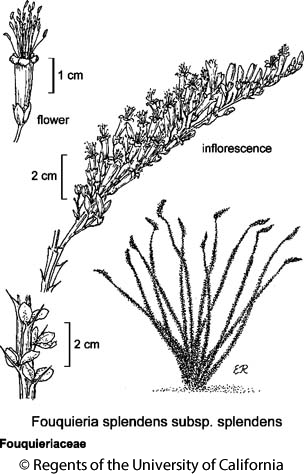 Inflorescence: panicle, generally 10--20 cm, widely to narrowly conic. Flower: corolla 1.8--2.5 cm; filaments each arising from hairy, +- 5 mm sheath. Fruit: +- 2 cm. Chromosomes: 2n=24. Ecology: Dry, generally rocky soils; Elevation: < 700 m. Bioregional Distribution: DSon; Distribution Outside California: to Texas, central Mexico, Baja California. Flowering Time: Mar--Jul Note: Stems used for fences, huts; bark for waxes, gums. Citation for this treatment: Lisa M. Schultheis & William J. Stone 2012, Fouquieria splendens subsp. splendens, in Jepson Flora Project (eds.) Jepson eFlora, http://ucjeps.berkeley.edu/eflora/eflora_display.php?tid=77256, accessed on April 21, 2019.